The title alone, “Self-doubt plagues female astronomers” leaves little uncertainty as to what the rest of the article is about. 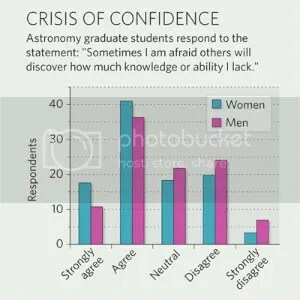 Essentially, a study was done to investigate how many astronomers are fearful that they might be exposed as having a lack of knowledge. At least in the groups surveyed (in US institutions), women are more fearful than men in regards to being “exposed”. I have to say, I’m not entirely sure what to make of this. As with a lot of sociological studies, the sample size is fairly small. Scientifically, I’d have to say that further study is warranted. It would be interesting to see if this graph changes geographically. Are people less concerned in Europe than in America? What about China, India or South America? It’s also noteworthy that in both genders, the majority vote was for “agree”. Feelings of inadequacy are a fear for both men and women. On the other hand, more women “strongly agree”, which does hint at a greater lack of confidence. Could it be that women are more fearful than men? Alternatively, could it be that men are simply less likely to consider a lack of knowledge in some areas to be a problem? These are open questions which it’s difficult to speculate on. It’s also notable that female professors are quite rare in physical sciences. Lecturers less so, but professors certainly. One has to wonder if it would be helpful to have more female role models like good old Jocelyn Bell Burnell. If I’m perfectly honest, my gender notwithstanding, showing a lack of knowledge is always a concern of mine. I’ll admit that it’s probably irrational. No one can be expected to know everything about everything, and in research it seems remarkably common for people to become so engrossed in their own specialty that they start to lose track of other fields. That’s a big part of why I keep this blog. To write about things, I need to read about them. If I read it helps me understand. Maybe it’s true what they say, that knowledge is power. Or mayhap it’s just academic currency. All the same, from an inside perspective it’s easy to see how a lack of knowledge can feel like weakness. It feels almost darwinian at times. Survival of the smartest, perhaps. Rational or otherwise, thoughts like these running through my mind are usually enough to make me think twice about raising my hand to ask a question at the end of a seminar. The so-called “impostor syndrome” has apparently been documented in all parts of the academic world (and indeed, elsewhere too). It’s characterised by paranoia and unfounded feelings of inadequacy. The impression that one doesn’t belong where they are and are therefore at constant risk of being discovered and cast out — even inspite of overwhelming evidence to the contrary. Feelings like this can really add to stress levels, as well as sapping motivation. In the most extreme cases, it’s easy to see how impostor syndrome could cause someone to actually change professions. In fact, it’s lamentable how many brilliant minds may already have been lost in this way. So what can be done? Well, irrespective of gender, not chastising others for a lack of knowledge would certainly be beneficial. Likewise, teaching people to realise that sometimes you need to feel a little bit ignorant. Sometmes, that’s precisely what should give you the motivation to improve yourself. It isn’t always immediately apparent that, if ever you’re worried that you don’t know enough — everyone, from undergrads to vice chancellors have felt the same way in the past. And probably still do. The bottom line here is: several of my most respected colleagues (and very good friends) are women. Should any of them ever consider leaving astronomy due to the feeling that they aren’t good enough, I’d be dismayed.